The JVC XA-F57E MP3 player features 512MB flash memory capable of storing up to 120 MP3s, an LCD screen with backlight, 5 preset EQ and 1 user modes and an 18bit Sigma-Delta D/A converter. Upon fully charged the player’s Lithium-ion battery can provide up to 11 hours of playback, also provided within the device are an inline mic socket and a USB 2.0 port. 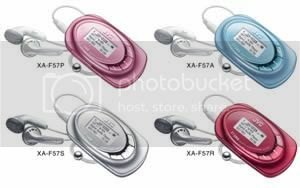 The JVC XA-F57E MP3 player which also supports WMA format is also supplied with a headphone with neck strap and will be available in four colours including pink, silver, blue and red. Price currently unknown.